According to Content Marketing Institute and Marketing Profs, 50% of marketers say that producing content consistently is a top challenge. Our clients at TopRank Online Marketing verify this statistic every day – as does our own team. Substantial content that answers audience questions in an authoritative way doesn’t grow on trees. 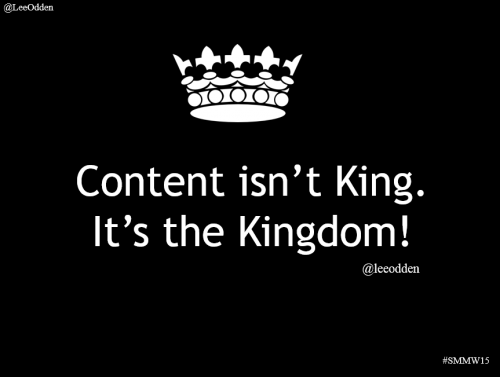 Good content takes precious time and energy to create! You’ll be happy to hear that marketers don’t need to create more content – they just need to create smarter content. This is where the idea of repurposing comes in – and Lee Odden is a big fan. If you’ve never abided by the three “R’s” – “reduce, reuse, recycle,” then you might be wondering why would I want to repurpose my content? What good will that do me? Lee Odden is CEO here at TopRank, author of the book Optimize and founder of this blog, where he’s been actively sharing insights for over 10 years. At one of the final sessions of Social Media Marketing World 2015, Lee gave insights to an audience of how to go about this repurposing business to get the most out of the content you’ve already created. If you think you’re too small to benefit from content repurposing, know that even little businesses can have a big impact through content creation and reuse. Take the TopRank Blog for an example. After 11 years, the blog has brought in over 2 million visitors per year to read over 3,700 blog posts. Across our various social channels, we reach over 300,000 fans. We’re not a huge corporation – we’re a normal-sized agency. Are we writing and designing content 24/7? No way! The team writes and creates original content, but we employ a variety of content creation timesavers to extend the reach, visibility, and impact of the blog as a whole. Your target audience has faces. They are real, unique human beings with likes, dislikes, hobbies, preferences, and questions. Do they like your content? Are you thinking of them when you create it? Let’s be honest: as marketers, don’t we sometimes get caught up in our own KPIs? As we develop content we start to think more about checking off a box on our content spreadsheet than catering something special to our customers. “People are making a lot of poop that isn’t aligning with solving problems for a particular customer,” Lee says. 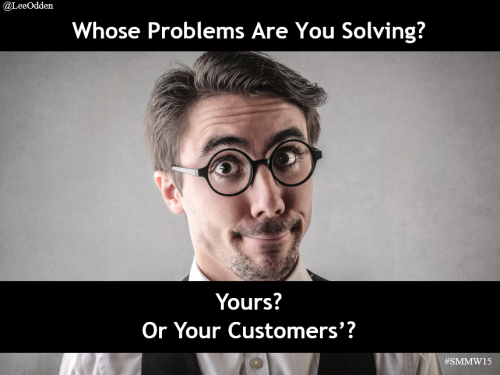 Be empathetic and curious – care about your readers’ preferences and activities! What are they searching for? Do they really like the content they’re consuming? What devices are they searching on? How will this content attract the right audience, at the right time, in the right place? How will this content really them on the right channel, right type of media, on the right channels and devices? How will this content convert them to the next stage in the buying cycle, to a lead, a customer, an advocate? Kapost is an excellent example for repurposing content. In what they called a “content pillar,” they created 122 assets from a single eBook. If that kind of repurposing blows your mind, don’t fear. Lee has concrete ideas and examples for how you can re-see your current content in various fashions and use it to your advantage. You’ll find something below that you can try. 1. Big to small. Take a piece that you’ve co-created and break it up into tweets, visual quotes, and social messages. 2. Small to big: news curation. Create curated lists of top content from sites like Viral News Chart or BuzzSumo. 3. Small to big: nuggets. Take stats, quotes, tips, or other separate elements and assemble them into something larger – for instance, a blog post, fact sheet, or even microsite meant to give a customer a certain type of content all in one spot. 4. Explode interviews. Host a series of interviews that ask the same questions – then compile them into an eBook and share them socially. 5. Repurpose as a theme. One large eBook can be broken up into a webinar, infographic, blog content, etc. – and updated every year or refreshed to be more current. Sometimes a plain old cheeseburger hits the spot – but a burger can be so much more when you add toppings like barbecue sauce, fried onions, or avocado. Adding toppings to a burger customizes it to what you like and want. In the same way, repurposed content is so much better when it’s tweaked to fit whatever audience it’s meant to reach. This doesn’t mean rewriting or new content creation necessarily – it’s packaging your existing content in a way in which your audience wants to consume it. Customize your content “burger” with the toppings your customers want, and prove that you know them by doing it without them asking, leveraging the insights you have into their likes and preferences. Do you repurpose content? Do you customize repurposed content for specific target audiences and stages of the buying cycle? Glad you found it useful, Richa! 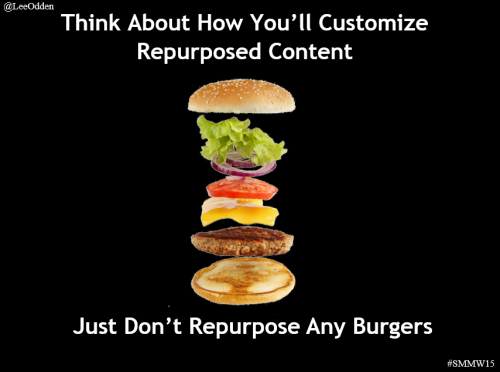 There is so much opportunity to extend the life and value of your content through repurposing.